Full of Noises Commission with support from Women Make Music, PRS. "An outdoor Ambisonic sound system in a shopping centre? Don't be daft! Bet you didn't know they had one of these in Workington? Well, they do - Its called The Hub. 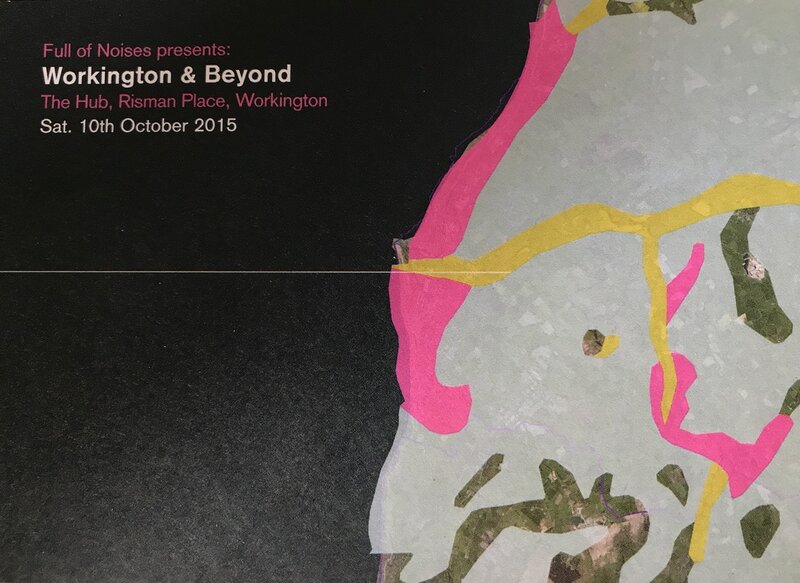 An ongoing strand of the 'Full of Noises' programme focuses on multi-channel diffusion and spatial audio work so we are really excited to be able to commission Brona Martin to work with the Hub in Workington bringing New Music to audiences in Cumbria, making use of the UK's only public outdoor 3D ambisonic sound system. The commissioned work will be accompanied by a programme of fixed media multi-channel pieces by women composers, curated by Full of Noises with Brona. Following the premiere in Workington the programme will go on a short tour to Lancaster, Leicester and London and will subsequently feature in our 2015 Full of Noises festival in Barrow in Furness." Day 1: Took the train from Leicester at 11 and got to Workington around 4 changing at Birmingham New Street and Carlyle. I went into town to find 'The Hub’, outdoor sound system located in the centre of the town. Cindy Lauper was booming from the loudspeakers. Then I walked to my hotel, The Green Dragon located in the lovely cobbled Portland square near Curwen Park where I checked in and did some research on the area. I went and had dinner in a traditional English pub where there were 2 meals worth of food put in front of me and then walked around the town. Day 2: Breakfast 8.30am. I got all my gear ready and went walking towards the train-station to find the England Coast Path. I explored the estuary of the River Derwent along Town Quay. I walked back along the river and found an iron bridge that goes over the railway line. I set up my recording gear including DPA mics and some hydrophones. A train went under the bridge just as I was setting up and reverberation through the bridge was quite strong. So I checked the train times and there was a train due in 10 mins. I quickly set up my gear hoping the hydrophones (I had no contact mics) would record the resonant sound of the train going under the iron bridge. I also made some hydrophone recordings at the small tributary of the River Derwent at two locations as I made my way Northwards. I was looking for the national trail that would bring me north along the coast. I walked northwards but decided to head for Siddick Ponds Nature Reserve. This is a beautiful area full of wildlife and walking paths. I made some recordings here of birds and sheep. I made my way South Eastwards along the path, then northwards towards the remains of a Roman Fort and then southwards again along the path and back into Workington. Day 3: On my next recording trip I explored the ruins and surroundings of Workington Hall, ancestral home of the Curwen family dating back to 1379. It is a beautiful building with a fascinating history, which can be read about here. It was here that Mary Stuart, Queen of Scots spent her last night of freedom before she was taken into captivity to Carlisle Castle. John Christian Curwen (1756-1828) who married into the Curwen family is the pioneer of many developments in agriculture and was Lord of the Manor at Workington. Beyond the Lakes explores the inner sonic qualities and rhythms of the sounds that I recorded during my trip to Workington. These were the sounds that I was drawn to as I explored the soundscape. A new environment brings sounds that invade our listening space because they are new, unfamiliar and interesting ----->The screech of seagulls in Portland Square, a small cobbled square surrounded by concrete dwellings, echoes outside my hotel window along with the dawn chorus that drove me to grab my recording gear at 4.30am. The almost mourning call of the seagull and other birds presents interesting sonic characteristics, almost a human-like cry. This call has been used to create drones of granulated textures within the work, while standing alone as a dramatic mournful call that brings the piece to an end. What am I trying to express within this work? Perhaps a hidden, melancholic world that reflects both historic events that have occurred around Workington Hall, such as the arrival of Mary Queen of Scots as she fled from Scotland in 1568. These are combined with present day soundscape recordings; the song of the blackbird, a family of ducks having a mooch amongst the reeds and a dog frolicking in the river that flows around the hall. Jez Riley French hydrophones, borrowed from my good friend and sound artist Lucy Stevens, were used to capture the delicate pops and clicks omitted from the tiny inhabitants of this gentle flowing river. While often some soundscape compositions highlight environmental concerns and the damage that humans are doing to the planet- for this work I chose to focus on the beautiful sonic worlds that exist in Workington without drawing attention to the aspects of Workington's industrial soundscape. As a part of this commission I curated a concert for the Full of Noises Festival, 1st August 2015. This concert was also performed at the following events: Full of Noises Event at Cafe Oto, London 5th August, 2015 and Women in Sound Women on Sound Symposium (WISWOS), 13th November 2015. The concert programme featured my new work Beyond the Lakes and works my Cathy Lane, Annie Mahtani, Karen Power, Linda O'Keeffe and Virginie Viel. For these performances Hear This Space supplied a multi-channel loudspeaker system on which all the works were diffused. This created an immersive and enveloping environment where the spatial trajectories of sounds could be enhanced and embellished, along with the sense of perspective. 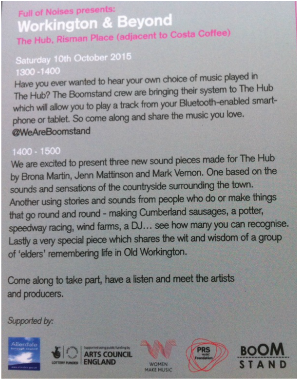 On the 10th October I had the opportunity to perform my new work Beyond the Lakes in Workington, Cumbria on the outdoor sound system ' The Hub', located in the town centre. This soundscape work is made from field recordings from Workington exploring the environmental and everyday sounds of the town. This piece was written as part of a Commission from the PRS for Music Foundation, Women Make Music Award in collaboration with The Octopus Collective based in Barrow-in-Furness. During this commission I had the wonderful opportunity to meet artists Mark Vernon and Jenn Mattinson who were also commissioned to create a work for the Hub. Their work titled Circular Thinking 'is a new multi-channel work created for The Hub – an open-air ambisonic sound system in Workington town centre. Over the course of a year Mark Vernon and Jenn Mattinson collected interviews and field recordings pertaining to circular processes, circuits, loops and all manner of rotating things throughout the region of Cumbria. The material used in the composition of the piece includes recordings of a potters wheel, a launderette, wind turbines, speedway races, a water mill, bicycle wheels, a clock restorer and a tour of the Cranston’s sausage factory where they make the famous spiralled Cumberland ring sausages. This first incarnation of the piece was diffused through the ‘Hear This Space’ sound system in a specially arranged quadrophonic mix as part of the FON festival 2015'. Working with the Octopus Collective has really made me think about public engagement and accessibility to the arts. Performing in Workington is a lot different to having a piece performed in a concert environment. The Hub system offered a new context for the performance. Performing the piece outdoors provides an environment that we have no control over, e.g people shouting, dogs barking, a man preaching the word of God using a very bad amp. However these sounds can add to the soundscape piece enhancing the overall real-world elements within the work. Of course we could not make the 'audience' listen. The audience were there on the day but most seemed to have no interest in what we were doing. People would turn their heads and say 'what is that sound?' when they were walking by, but carried on about their business. Some people stopped to ask us what we were doing. The public knew something was happening because some of the performers were standing in the centre listening and also we had a table with fliers. I think sometimes people are afraid to ask what is going on. They have come to town to shop. After all it is the weekend and what else are they going to do. Let's go shopping!!! Maybe they don't have time for art. The Octopus Collective is successfully bringing soundart and new music to the industrial towns in Cumbria. Along with the Octopus Collective, Barrow-in-Furness has some wonderful artistic projects/collectives/organisations that are successfully engaging with the public such as Art Gene and Signal Films. If it wasn't for the Octopus Collective I probably would never have gone to Barrow-in-Furness and Workington and met such wonderful artists and seen so many projects. Their work is crucial in engaging the public with art but also in getting more people to visit these places which are usually not on a person's 'somewhere I would like to go' list. Perhaps it is because The Lakes get in the way and the industrial associations with these places. For upcoming Octopus Collective events go to http://www.octopuscollective.org/. Why not plan a trip to Barrow or Workington. There are plenty of walking routes around these areas such as the England Coast Path. Barrow also has a wonderful Dock Museum. You may even get to see a nuclear submarine being launched! Both places have a fascinating industrial history. Workington is also home to Workington Hall, where Mary Queen of Scots spent a few nights when she fled from Scotland. The Helena Thompson Museum is worth a visit. More information at http://helenathompson.org.uk/Mary-Queen and there are some really lovely walks around Workington Hall.